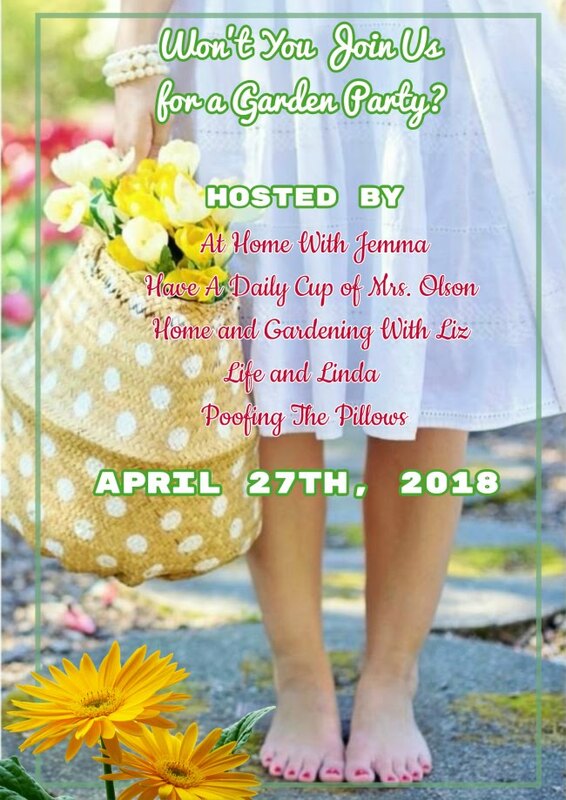 Welcome to the first Garden Party hosted by 4 other bloggers and myself. This will be a once a month Garden Party and we'd love for you to join us with a garden related post. Since our snow has just melted I'm not exactly gardening just yet so for this first post I have chosen to share pictures from last years spring flowers and to talk about how I like to use planters for my flowers. These are three darwin tulip varieties called Life's A Cabernet, All That Jazz and Light and Dreamy. These are a wonderful darwin tulip called Design Impression. Tall and very sturdy and the flowers last for days. This was taken around May 9th last year. My lilac topiary tree was leafing out and some primrose were also in bloom. Once our plants start to grow it really comes on fast. 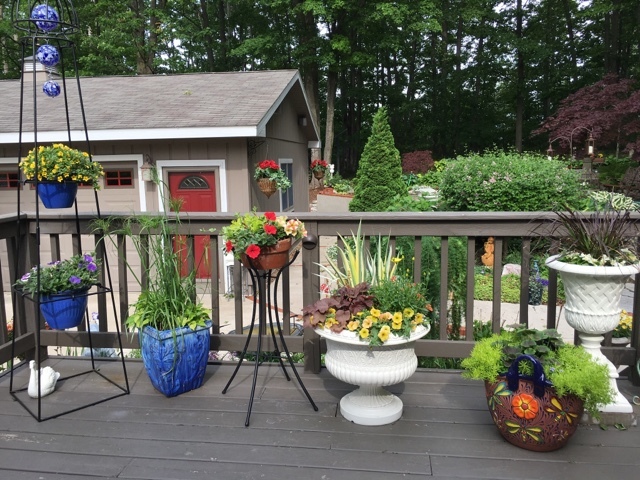 Last year I created this display on the deck to view with a variety of planters. This is directly outside from my kitchen dining area and I enjoyed viewing it each morning. I primarily use planters for my annuals. 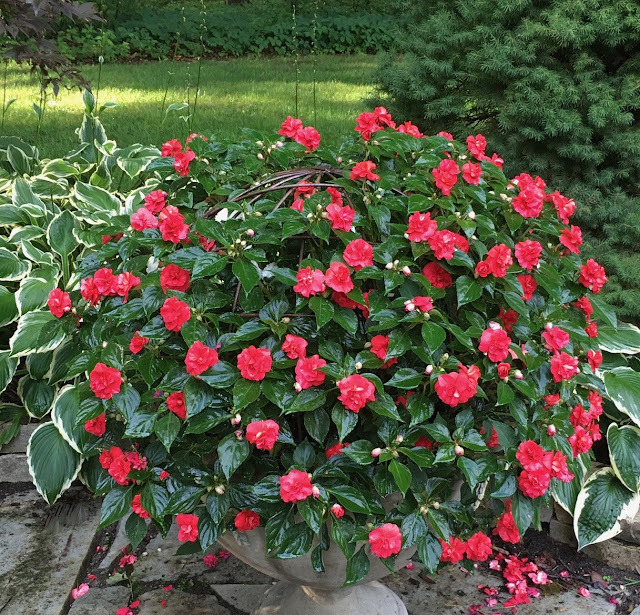 Container gardening is easy to maintain with watering and fertilizing plus they stay virtually weed free. 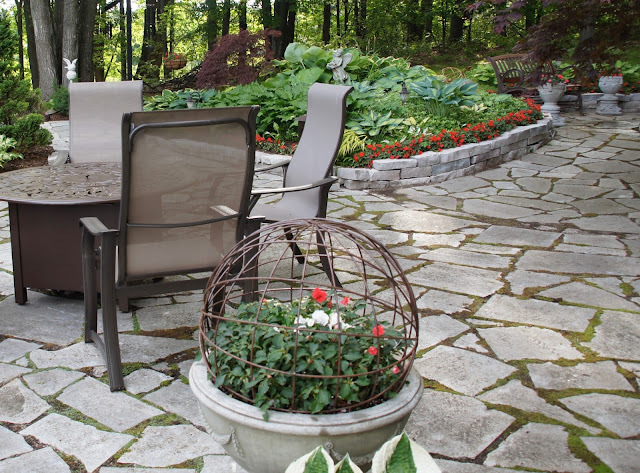 Planters like these allow you to place them where you want and if you have a limited space it allows you a burst of flowers contained in a small area. 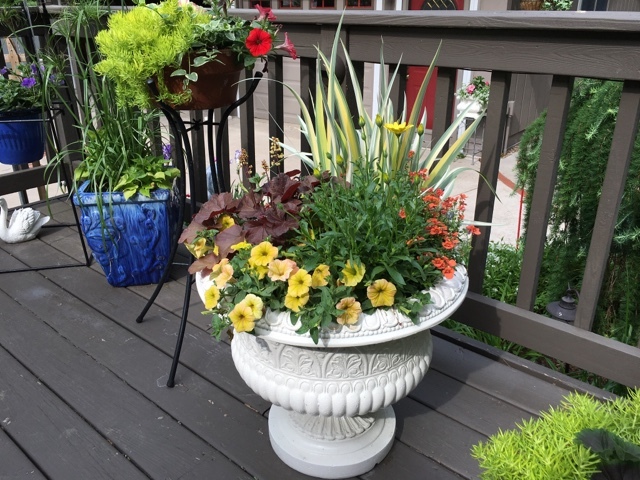 Last year I tried something new- I put some variegated Iris (a perennial) in this planter for the accent it offered (later in the fall I transplanted to a perennial bed). I used the black obelisk for plants and I added the three piece blue glass mosaic balls to the top for some visual interest and more color. A few years ago I started buying few blue planters and last year I painted the other planters white to look as summery as possible. The black metal plant stand is actually meant to hold a bird bath but I chose to use it for a plant. 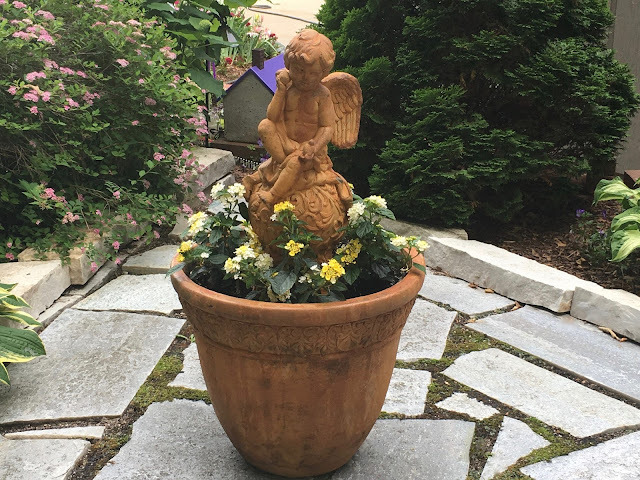 I stacked two planters together and added a metal obelisk for the Black Eyed Susan vine to grow on it and there was some Vinca Vine and yellow Lantana that filled in as time went by. Much later in the summer you can see how it really filled out! This is an old world looking planter and cherub. I stacked some bricks below the cherub to support it. I filled it with more Lantana (Verbena) which the butterflies love. I chose this "tulip" shape planter and decided to plant this large Caladium in it. 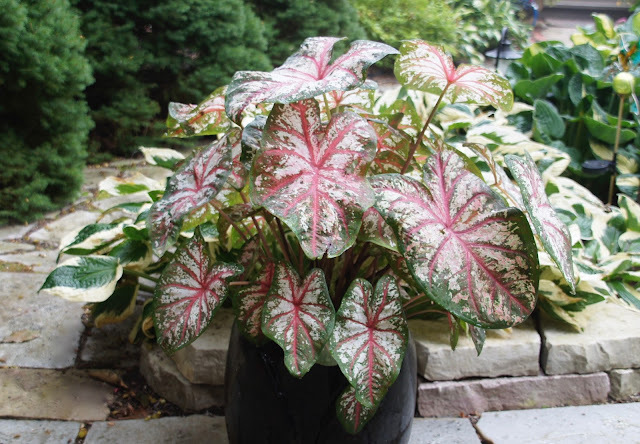 You don't always have to add multiple plants to get a nice look in a planter. Later on it had filled out beautifully. I have been using this metal garden art ball with this planter for a few years. I loaded it with a double impatience and by the end of the summer it was completely full. The impatience get kind of tall and the framing helps hold them together forming a nice rounded shape. 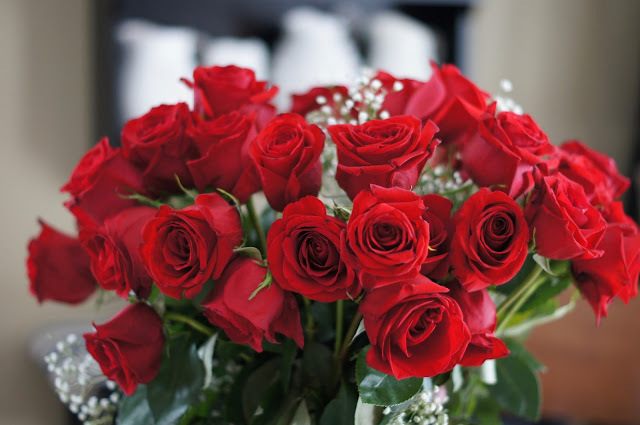 I like the double impatience flowers- they resemble little roses. They usually sell them individually potted vs. in trays or flats so they are pricer. 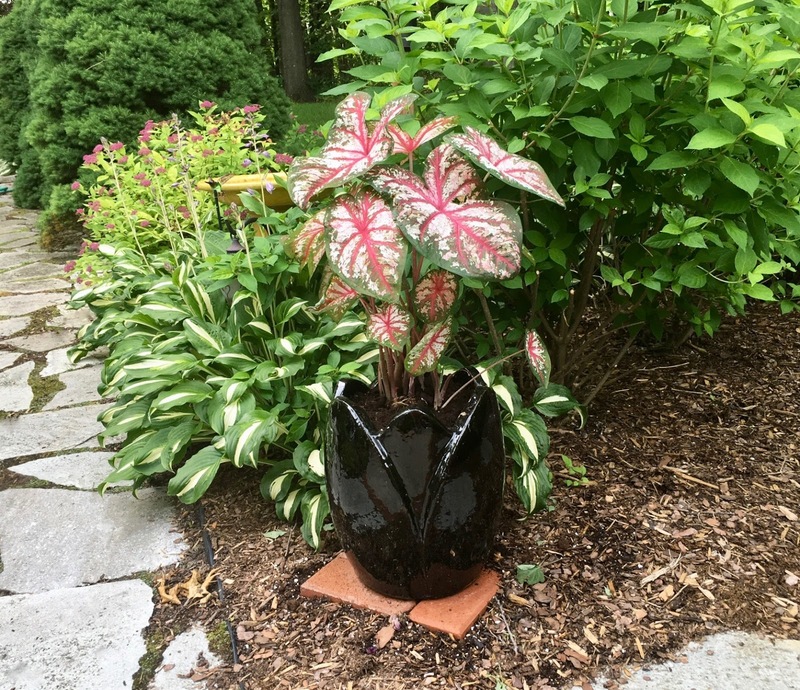 I planted my frog planter (from Pier 1 several years ago) with lobelia and this "Pink Chaos" Coleus. I like whimsical garden art. I've also used containers for fairy gardening. 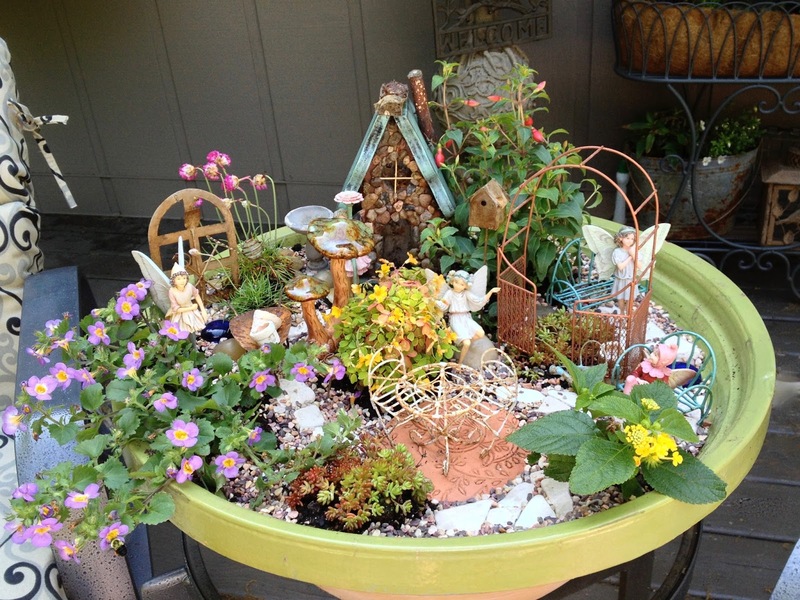 Using a planter to have a fairy garden is a great way to enjoy one in a small area. As the years have rolled by my fairy gardening expanded. 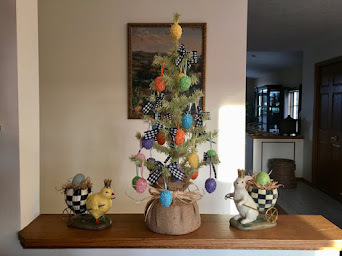 Each year I have a new design. These are pictures from last year. I use many things like artificial turf, stone walls, and various fairy garden accents. I created stone paths along with both artificial and real flowering plants and ground covers. I say be creative and allow your inner child to have some fun! 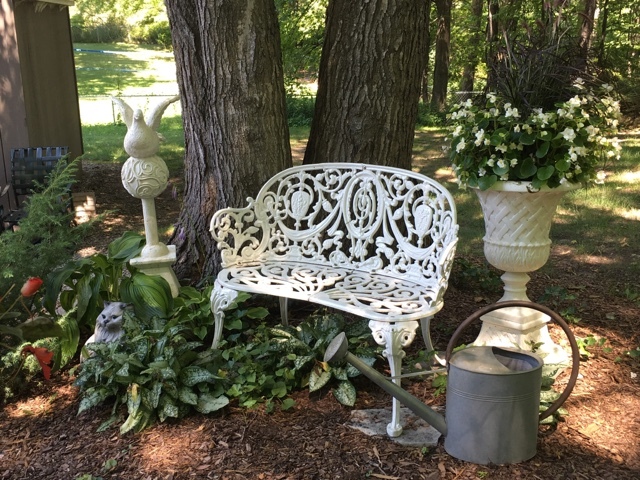 I also like to create garden vignettes to enjoy just because! I'd love for you to follow through the summer as I continue to do posts of my gardens. 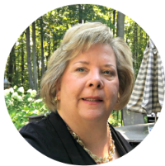 You'll find a spot to subscribe on the sidebar of my blog. 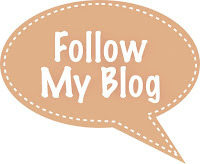 I hope you will link-up and visit other blog posts. The next Garden Party will be on May 25th. 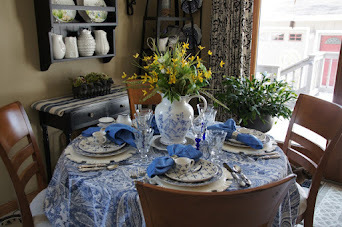 Susan from Between Naps On The Porch has been hosting Tablescape Thursday for many years and this week is the 500th Tablescape Thursday. 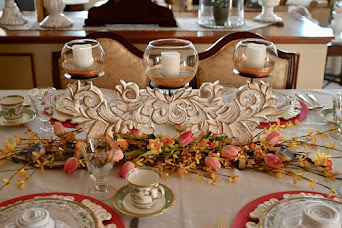 For this week's Tablescape Thursday party she came up with the idea that we put together a collection of our own favorite tablescapes. I selected tablescapes in chronological order. Choosing things that had some sentimental value and for their creativity. Links to the original posts are included under the first picture of each one. Back then there was a tablescaper called Bill (his blog is Affordable Accoutrements) that I was highly influenced by. His detail for design and romantic touches were the best! He was one classy guy but due to time budgeting he had to quit creating his tablescapes. In an email exchange he gave me the idea to add some kind of lighting to the pink vase which I did and it turned out wonderful! 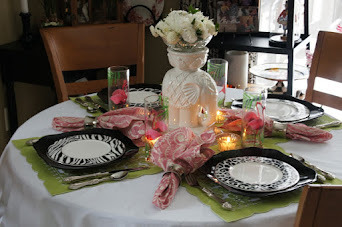 I put together a tablescape with an Asian designed influence. I was so excited because I never win anything! Afterward I gifted my daughter with the brown Swirl dishes. I used this wooden sleigh/tray for a centerpiece that had been gifted to me by our Son and daughter in-law so it added sentimental value. An all time favorite Christmas dish. I love the holidays and red is my favorite holiday color! Flowers from my gardens creating a perfect summery look! I adore this tablecloth. The colors are so cheerful and the vintage inspired design is wonderful. 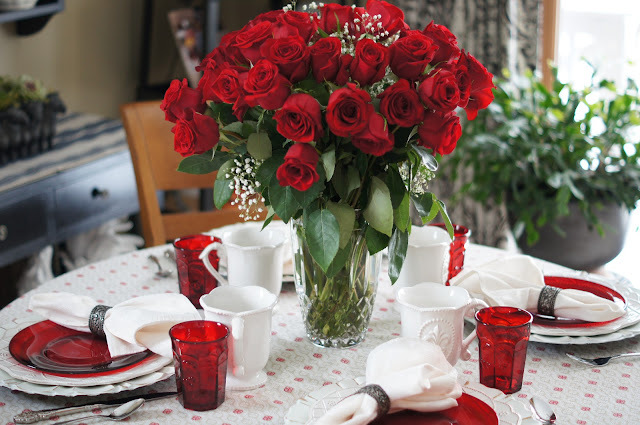 I really loved this combination of dishes and linens. I love the fleur de-lis symbol and I enjoyed how this all came together. Flowers from my own garden added just the right touch! I love nautical inspired things and these dishes were perfect for this seashore tablescape. Imagine yourself down by the seashore dining with friends! 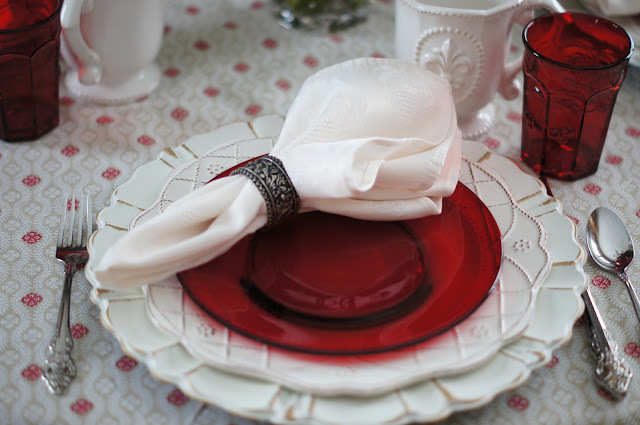 These dishes and the colors definitely spoke to me for a spring tablescape! 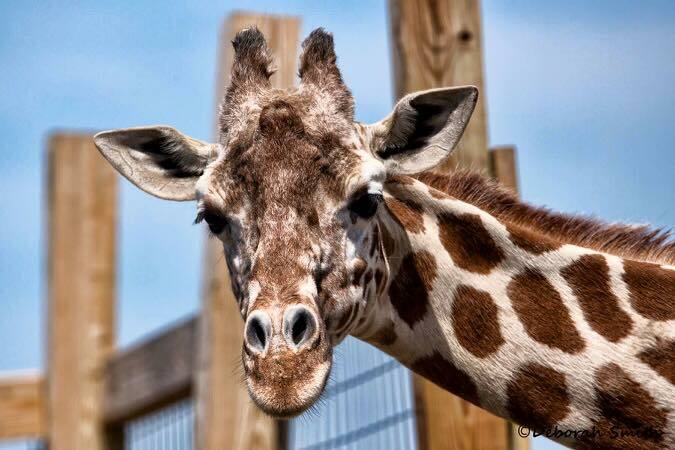 During the long winter months I was one of the millions of people that followed the story about April the giraffe and her expected delivery date. I needed this mental diversion after struggling through unexpected deaths as well as an 8 week sinus infection that drained everything out of me. She finally gave birth April 15th. I happened to have these chargers with a giraffe design on them and since the giraffes love leafy vegetables I chose the cabbage leaf plates. I felt the graceful way these cranes hold their necks and their long legs reminded me of the giraffes so they were chosen as my "stand-in giraffes"! I had to create a tablescape with these cheerful beach colors! I relate well to the "figures" of the ladies! I managed to find more plants/flowers from my gardens that worked out well. August 2017 lots of color! My mother turned 95 and I was inspired to create a table for her birthday. I was under the influence of Flamingos and just had to create something using them! Lastly my most recent- definitely sentimental 2018! Still can't believe it's been 40 years! 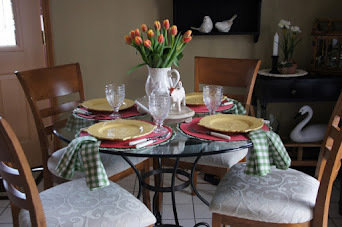 I hope you enjoyed the journey through some of my past tablescapes! It was difficult to select which ones to use but there are a lot more and you are always welcome to wander through my blog to see them! Just click the "Tablescape" button under the header at the top of the page.